Time has come to dive into the third part of my CDT gear list. If you missed the first part, on my big three, you’ll find it here. The second part, on cookware, water, and food storage, is here. Now let’s look at toiletries, medical kit, tools, and repair. 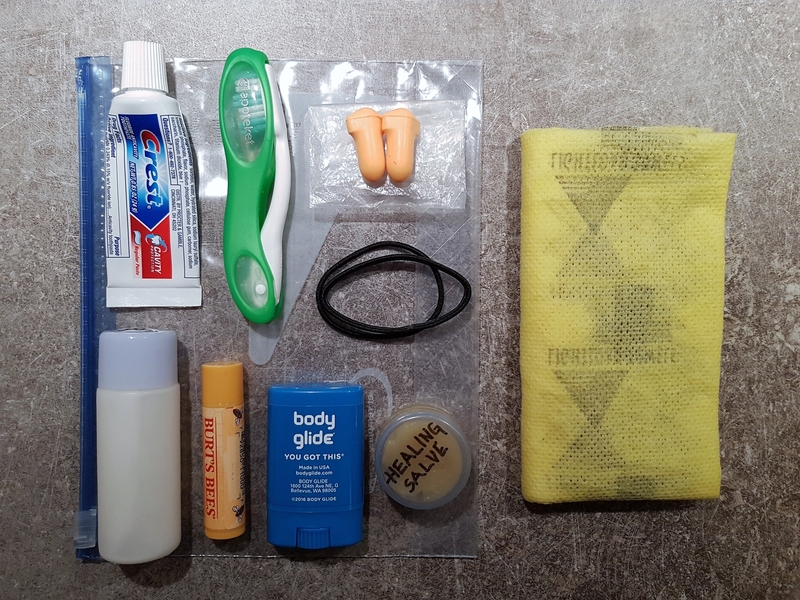 The glamorous toilet bag of a thru-hiker gives it away; we’re one special breed. We spend all day getting sweaty and dirty, we expose ourselves to the elements, and we abuse our feet for days on end. Under these circumstances we try to manage our hygiene using only a few items that fit in a ziplock bag and weigh next to nothing. We fight for a while to wipe away the dirt, until we eventually give in to that homeless look. The weirdest part? We’re at our very happiest like this. I present to you the contents of my ziplock toilet bag: toothbrush, toothpaste, earplugs, extra hair ties, Chapstick, Body Glide, healing salve, a piece of Lightload towel, and a tiny lotion. The Body Glide I carry as a precaution until my skin on those parts of my body that rub against each other has grown thick enough that I don’t have to worry about chafing. I wholeheartedly recommend Joshua Tree Healing Salve; it’s the kind of salve that doesn’t soften your skin. I use it on my feet before going to bed every night, and they thank me by recovering and staying blister free. I carry a tiny lotion because sometimes it feels like my skin is about to fall off and applying a little bit of lotion makes me instantly go from annoyed to happy. This kit weighs about 3.9 ounces. For selected parts of the trail I also use sunscreen and/or insect repellent, which weigh two to three ounces each. 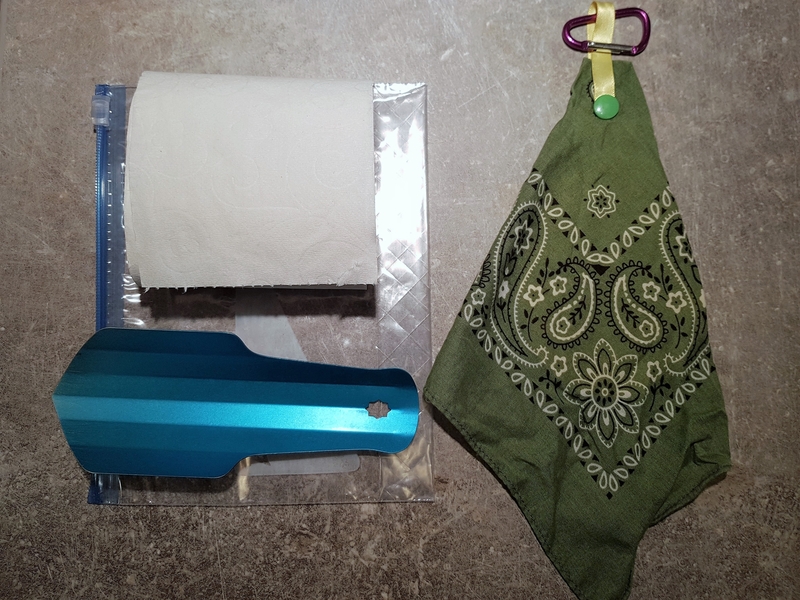 Another ziplock bag contains toilet paper and a 0.6 ounce Trowel. Attention, all girls; if you still aren’t using a pee rag, just get yourself one and thank me later. It doesn’t have to be fancy; any bandana will do. Personally I use and really like the WeeDanna. When I head out after a resupply my human waste kit weighs about three ounces, two of which are toilet paper. So what does one need to treat injuries and medical conditions on a trail like the CDT? The reality is that out in the wilderness you are likely to be your own or a fellow hiker’s first-responder if something happens. Having proper medical training and a relevant first aid kit become pretty important when advanced help may be days away. How prepared you want to be is, at the end of the day, a matter of personal choice. 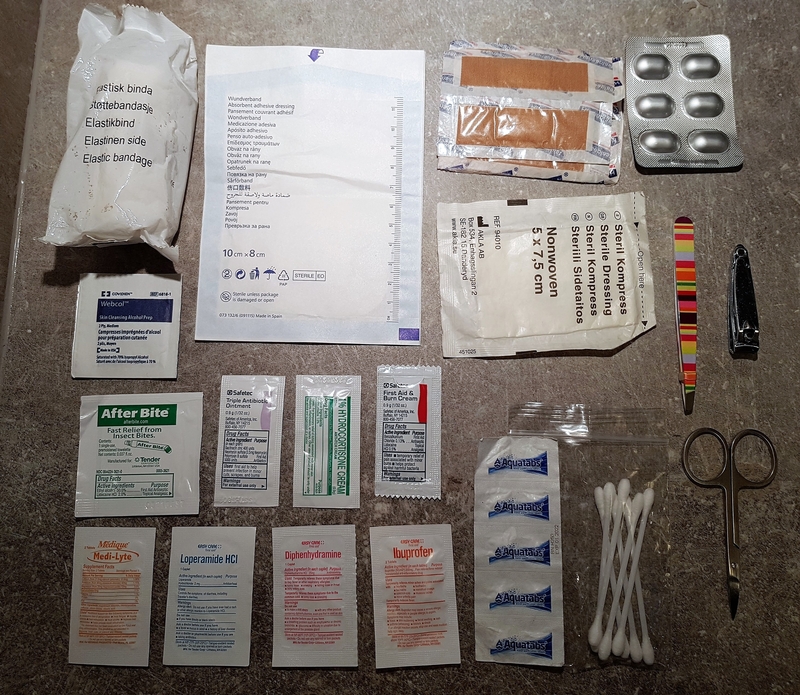 When putting together a medical kit, I start by deciding what injuries and conditions I want to be able to treat. For the CDT I am thinking primarily sprains, joint injuries, blisters, and wounds from a fall, cut, or burn. Elastic gauze bandage, sterile dressings, alcohol swabs, surgical tape, Band-Aids, Leukotape, burn cream, and antibiotic ointment go a very long way for this. To me it’s also important to be able to treat an allergic reaction, rash, sting or bite, diarrhea, pain, fever, and dehydration. I carry hydrocortisone cream, After Bite, ibuprofen, antihistamine, loperamide, acetaminophen. and electrolyte tablets for this. Since I suffer from migraines I also carry sumatriptan. Add scissors, tweezers, clippers, and Q-tips and there you have my complete medical kit that weighs 0.23 pounds. A long-distance hike is rough on gear, and chances are you’ll experience gear failure at some point on trail. I carry duct tape, which fixes pretty much anything. A pole sleeve will fix a broken tent pole. I also have an alcohol swab, glue dots, and repair patches, primarily to fix holes in my tent or sleeping pad. For clothes and other gear I rely on needle and thread, safety pins, dental floss, rubber bands, self-adhesive Velcro, and a spare lineloc. The o-ring to the Sawyer water filter has a tendency to disappear, so bring that spare one. This repair kit weighs about 1.5 ounces. I will also carry a neck knife and bear spray on the CDT. That’s a lot of things. 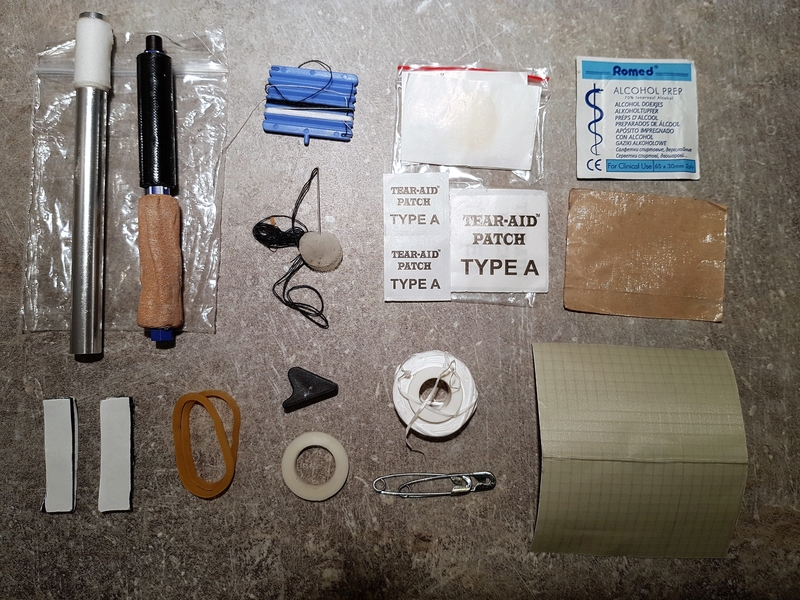 To add to it, the medical kit and the repair kit are gear you’re carrying but hoping you won’t have to use. This is how I do toiletries, medical kit, tools, and repair; your mileage may vary.